The Himalayan pilgrimages are the oldest organised travel system, evolved over time by Hindu sages and embodying the spirit of wander, adventure and spirituality"
Shiva is known to have made his home in the Himalayas. He built no house nor shelter, not for himself or for his bride. He was an ascetic and yet married; he could be both for "he was the wild god sporting in the forest or taking his ease on a cloud." During the yatra, stages of the walk are carefully controlled by the Indian authorities. The first stage of the trek is to Chandanwadi, the second to Sheshnag and the third over the Mahagunas Pass to Panchtami. 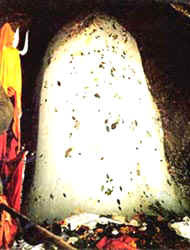 Many pilgrims visit the cave from Panchtami and return to Sheshnag the same day, walking back to Pahalgam on the fifth day. The descent to Panchtarni (3,450m) is quite long and tiring, but there are frequent flowered meadows to rest in and admire. The campsite can be seen from afar; and behind, on a further ridge, the bare, treeless mountain scape resembles the terrain on the far side of the Himalayas. There are more spacious campsites upstream from the main camping area, and these are also a little cleaner. This 15-km trek takes about five hours and it's an easy walk since there is little altitude change between Sonamarag and Baltal. One should be able to get a lift on a truck to the roadblock, from there on it is better to walk. The roadblock is closed until noon or later, waiting for traffic to come across the Zoji la from Ladakh. From the roadblock one can walk along the river valley track, which is very pleasant. The river valley track is also 2 to 3-km shorter than the vehicle road. A military camp is the first sign of Baltal, which can be reached in a day from Srinagar. The 15-km trek to Amarnath climbs over a thousand metres from Baltal at 2,743 metres to the cave at 4,175 metres and the walk takes about nine to 10 hours. The route crosses one major snow bridge over a river and climbs steadily up, crossing the Satsing pass, 3 �-km before Amarnath, at 4,115 metres dropping down and then climbing up again to the cave at 4,175 metres. There are some tea stalls along the way, even at the river, and after the junction with the main trail there are even more. 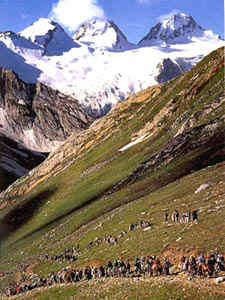 From Amarnath one can follow the traditional yatra trail down to Pahalgam. Amarnath to Baltal & Sonamarg from the Amarnath cave return along the pilgrim trail as far as the junction of the Panchtarni and Amarvati rivers. Here the trails divert, with the track to Baltal heading down the true right of the valley. The trail is prone to rock avalanches where it traverses large scree slopes and one should be wary of descending without first checking its condition. If there are no problems, the trek to Baltal can be completed in about four hours. Road: From Baltal there is a regular bus service during the pilgrimage period, getting back to Srinagar that night. At other times, camp at Baltal and continue to Sonamarg at a more leisurely pace the following morning. From Sonamarg there are three buses a day to Srinagar and the drive takes around five hours.